I wish I’d taken a screenshot of the Facebook event page where this was being promoted because the description was also problematic. Women expressed serious concerns over the representation of Muslim women in the poster and in the description–and the fact that there were only three women speakers among thirteen men presenters, and I wish I’d taken a screenshot of those comments. (If anyone else did, please let me know.) The person managing the page responded to some of the comments and said things like, “There isn’t enough time to cover every speaker” (so, yes, go ahead and allot that time to almost all men? How does that even make any sense? 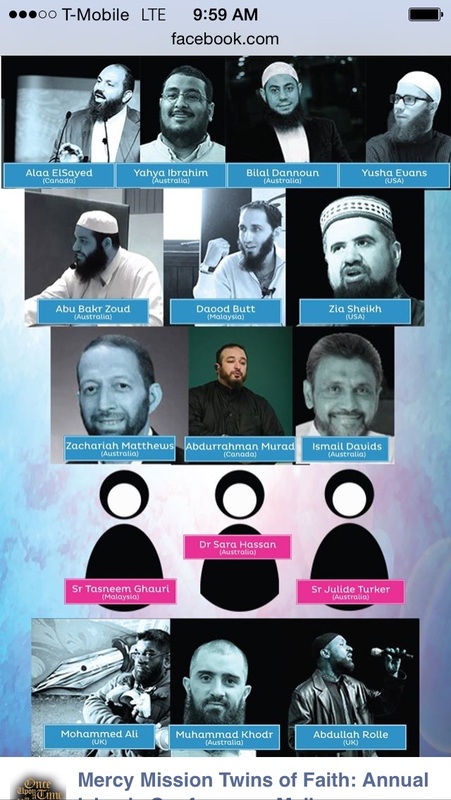 There’s not enough time in the day to cover all Muslim scholars’ voices, and so let’s have 13 men and 3 women?… If you’re gonna have a total of 16 speakers, then have 8 women and 8 men!) or “not enough Muslim women scholars willing to participate” (! False! Who all was invited to this?) and the other usual excuses we’ve grown tired of hearing. In fact, check this Bingo out to the right. The event page was deleted once the page manager saw the comments. 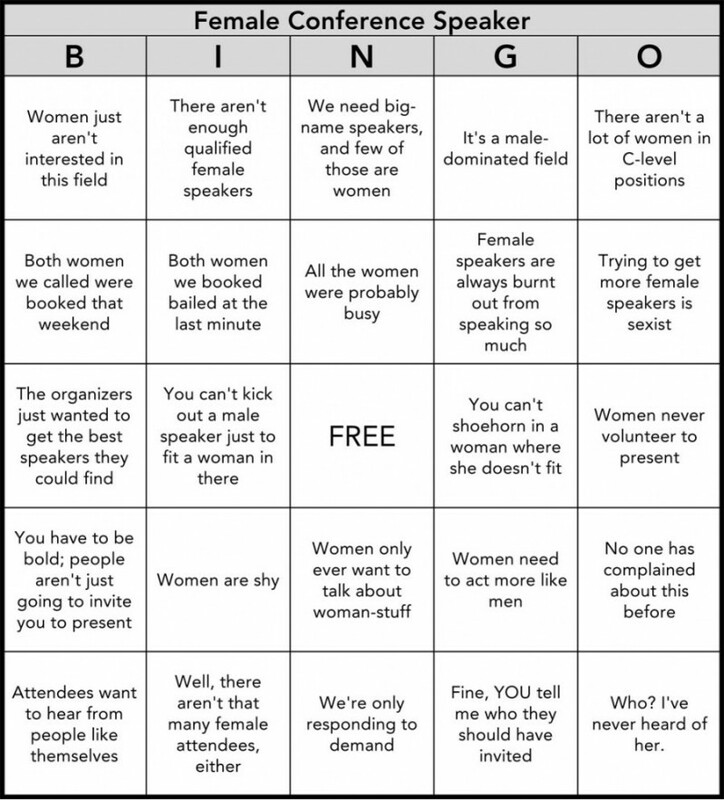 He did respond to some of them (to tell us why we were in the wrong for accusing them of intentionally not including enough women and presenting faceless women speakers). but eventually deleted the whole thing. Because the Delete button is patriarchy’s best friend and it solves all its problem. He told me in a private message that he deleted it because he didn’t think our rants were getting anywhere…. I wholeheartedly disagreed: He found our observations and critical remarks threatening to his patriarchal vision of Islam and Muslim women. What the women were saying wasn’t “baseless” (and even if it was baseless, you simply ignore them instead of deleting them! ); they had legitimate concerns, and they each knew what they were saying. Because they were right and not in favor of patriarchy, the person managing the FB page decided to delete the whole conversation so that there’s no evidence that the conversation ever took place, or so that future readers would see where he was at fault. And still he dared to say that our comments were baseless and not going anywhere. He refused to acknowledge that there was a problem with the way the event was framed, and he instead told us that we need to stop complaining and ranting – and that we should be grateful (as one female commenter pointed out) that there were at least three women speaking, as opposed to the usual none. He didn’t understand our point because he said, “We have women-only events all the time to accommodate women,” and he was troubled by my suggestion that while women-only events are great, we actually need to hold conversations with Muslim men, alongside Muslim men – he said that was not Islamic. Anyone who has a Facebook, I urge you to contact the person who manages the Facebook page for Mercy Mission and let him know that we women do pay attention to these things, we note when we’re missing from conversations on Islam and faith and knowledge, and that we don’t appreciate the patriarchal (re)presentation of us as preferably invisible women (unless it’s our choice – but it’s not the choice of most of us, and that reality needs to be reflected in such events). It’s easier to be pessimistic about the state and future of Muslim women in the Muslim community especially in the West, but I assure you that our voice does have power and strength; we can’t afford to give up and let patriarchy continue to render us faceless and invisible. This entry was posted in Death to patriarchy and tagged female authority in Islam, Islamophobia, male-only panels, where are the women?. Bookmark the permalink. To all of those who challenged the admin; thank you. It is very much appreciated seriously… maybe one day, in Melbourne we can have a non- segregated mosque. *sigh* Make dua for us please? ❤ Absolutely. By non-segregated, do you mean there are separate mosques for women and separate ones for men? Or that inside the mosques, there's gender segregation? Because the latter is the case here as well. I've been to a lot of mosques but never to one where there was no segregation – or where women were welcome in the main, default space which is designed naturally for men! I do know, however, that there's the El-Tawhid Juma Circle in Toronto where there's no discrimination and no segregation of any sort whatsoever. Everyone's invited and encourage to pray and sit and stand where they're comfortable doing so. This makes me tear up every time I think of it. God bless its organizers, aameen. This is not the question of equal speakers, This is the question of skilled one. I have no concerns if all the speakers are women if they are more in knowledge. Hate for men reflects from your every word. Please be liberal instead of creating inappropriate bias on the name of men and women. Keep in mind the real mission of Muslims regardless of gender, spread the Islam what it is; the teachings of Quran and Hadith. Please utilize your time to highlight actual partiality among men and women. You have a very misguided sense of how this world functions. Don’t ever, in any breath of yours, give yourself the pleasure again to come here and tell me what I should be doing instead – or to dare tell me that it’s not a question of gender but of knowledge. No, it’s a question of power and patriarchy, actually, which a man of your thinking wouldn’t and couldn’t bother to reflect critically on because it serves, privileges, and advantages you as a male… regardless of your knowledge, skills, etc. However, I’m thrilled that a man like you decided to read this blog. The perfect audience. God reward you for your time! Well, I have not dealt how the world functions, it is only knows by its creator. Now you are taking it personally to restrict me to read your ideas and comment because you might don’t dare to face the opponents or the ones that oppose your vision. This is one sided approach, researchers are multidimensional. Oh, no – no offense taken. The patriarchy police are the last of all creatures to offend me. Don’t flatter yourself. “This is one sided approach, researchers are multidimensional.”, this line was for you as I know that you are a PhD student; researcher for a specific time. My question remain silent that I exposed in the first post. Yeah, that’s another way of a telling a woman she’s not logical and can’t engage in a conversation without getting all worked up about something she’s too passionate about. That perspective is not welcome on my blog. Naturally, I disagree with you that this a one-sided approach. But I also do not care what a patriarchal-minded man thinks of my argument. You claim that the issue here isn’t gender but actually knowledge, and I totally disagree – it’s power. Patriarchy determines whether women are knowledgeable about a subject or not, and there’s no logical reason why patriarchy would acknowledge that a woman *is* knowledgeable about something like Islam and faith. So, no, it’s not about knowledge. It’s about recognition, which is a matter of power. Yes totally agree!. Now you are coming to the actual argument that this is the game of power not gender inequality. Therefore, man is more powerful than women by nature. Like gravity, you can not go upward if you do then you need more power than gravity that is scientifically 9.8 m/sec^2. If you do not see the gender issue here or relationship between gender & power here, you don’t understand this at all – and we definitely don’t agree. Also, disgustingly untrue that man is naturally more powerful than woman. Wow. You need to update your knowledge because that’s been proven false repeatedly in the last several decades. No wonder you think patriarchally. It makes you feel like you’re more powerful than women even though you’re not at all. I have never claim the intelligence or wisdom based on gender so I am not saying that female scholars are less or more in knowledge. I don’t think patriarchally, this is where you start thinking according to your fix mindset. How do you claim that male are not powerful than female? In every attribute they are more powerful since centuries. Well this is the use of power that you restrict my comments to be available on this page. I am with a mindset that a men have more power than women then you just prove me wrong instead restricting me posting here. Read your first comment where you said this wasn’t about gender but about knowledgeability or skill. Your assumption was that women are excluded becuz of their lack of knowledge as opposed to the men. Burden of proof is on you – to prove that men are indeed naturally more powerful than women & hence why they get more authority and recognition than women. Prove it. Tradition isn’t proof, by the way; you can’t say, “Because they’ve always been the ones in (political) power,” etc. because that doesn’t mean they’re powerful naturally. And also, don’t use the simplistic claim that (some) men are physically stronger than (some) women – physical strength isn’t natural power and doesn’t explain why, as in the above case, women’s authority goes ignored. And some men’s physical strength over some women doesn’t mean “men” are more powerful than women or should/can be in positions of power unlike women. Lastly, I said it before & will repeat: I do not entertain misogynists here. You have one last chance. Where you’ll prove your false patriarchal claim about men’s power. You won’t be able to prove it, though – and that’ll be the very last patriarchal comment you’ll make on my blog. Also, stop insulting women’s intelligence by claiming they are not as knowledgable about Islam, even if you mean they’re not in not as large a number, as the men. There are more than enough Muslim female scholars of Islam, perfectly knowledgeable and competent and qualified who should have been invited to this event and to the one I wrote about before this – and to every other male-dominated / all-male event on Islam (or any other religion or subject anywhere). And yet you dare to tell me this isn’t about gender. You really have no idea how this world works, do you. LOL @ your mention of gravity into this discussion to make yourself sound important and impressive. You’re not. For Gravity to be relevant here, you’d have to in fact be more powerful than women such that women are naturally incapable of attaining power or your level of anything. Also, I don’t allow men who think men are powerful by nature and women not powerful by nature to speak on my blog. Go read about this question of power particarly in its relation to gender, and I may let you return to opine then. Delete and problem solved 😀 Sad! Exactly! They think we’ll shut up and hopefully stop existing if they delete our critical remarks telling them to add more women to a conference on Islam – nope. We’re still here. And $10 on the fact that the three women are only allowed to agree with the thirteen men and can’t have her own say. Same with our patriarchal leaders. Replace “America” with them, and you got it! Ugh!! Submit that to the All-Male Panel Tumblr 🙂 I’ve submitted so many to them – can’t wait for them to get to them and post them up. It’s embarrassing, really. I already submitted them; will look if they posted them. And yes, it’s embarrassing indeed. Oh S!! That’s such a kind message 🙂 Thank you! God reward you for the wishes. A wonderfully Mubarak Ramadhan to you as well! May it be a source of peace, purification, and light for you and your loved ones, aameen! Mercy Mission has Being Me as well – it’s North America’s first Muslim Women’s Conference.http://www.being-me.org/toronto/index.php#speakers you’ll notice that most all the speakers listed are women this year.